Hi and welcome to OvarianCystsTreatment.com, the official website for "Ovarian Cysts Treatment: The 3-Step Home Treatment Program for Ovarian Cysts." The Ovarian Cysts Treatment program was written to help women around the world find relief from the pain and suffering caused by ovarian cysts. 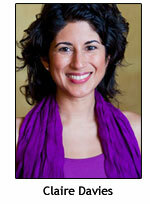 The author of the Ovarian Cysts Treatment program is Claire Davies, a 33 year old woman from Vancouver, Canada. Claire's own personal struggle with ovarian cysts lead her to extensively research the subject for herself. Upon realizing there were many other women out there going through the same thing she had been going through, Claire decided to put together a step by step guide full of all her research. This guide, now called Ovarian Cysts Treatment: The 3-Step Home Treatment Program for Ovarian Cysts is available for download from this site. Please see our main page for more information on Ovarian Cysts Treatment. Thank you for visiting OvarianCystsTreatment.com. If you have any questions please contact us. We would love to hear from you and we are always working hard to improve our ovarian cysts treatment program for the benefit of women all over the world!